Kitty cats, you may currently be lounging in the middle of nowhere, wishing that you were trotting through the gritty yet oh-so glamorous boroughs of New York City; but one need not hop a plane to JFK to experience a worldly locale full of bright lights and gorgeous residents – she need only to slip her petite wrist into a ravishing RumbaTime Watch from the Lafayette series (named after NYC's Lafayette Street) to bring the city and its charming characters to life. And now three (3) fabulous fashionistas will be taking precisely that home! Café Fashionista has teamed up with RumbaTime to bring the Lafayette Watch (as seen on Pretty Little Liars’ Shay Mitchell) in your choice of color (Cotton Candy, Double Dare, Lights Out, Snow Patrol, Big Apple, Lemon Drop, or Denim) to three (3) gorgeous glamazons. I don a Cotton Candy version, Shay loves Snow Patrol, and Willow Smith is partial to Big Apple. Now it’s your turn to select the color that best fits your personality! ♥Visit RumbaTime and choose your favorite color from the Lafayette series. ♥For one (1) entry, leave a comment on this post stating which Lafayette Watch color is your favorite (Cotton Candy, Double Dare, Lights Out, Snow Patrol, Big Apple, Lemon Drop, or Denim) between now and Friday, February 25, 2011 at midnight PST. ♥ For two (2) entries, Twitter about this giveaway, and leave a comment on this post stating which Lafayette Watch color is your favorite (Cotton Candy, Double Dare, Lights Out, Snow Patrol, Big Apple, Lemon Drop, or Denim) between now and Friday, February 25, 2011 at midnight PST with your Twitter URL. ♥ For three (3) entries, become a follower of Café Fashionista on Blogger/Google Reader/Google Friend Connect/Twitter, and leave a comment on this post stating which Lafayette Watch color is your favorite (Cotton Candy, Double Dare, Lights Out, Snow Patrol, Big Apple, Lemon Drop, or Denim) between now and Friday, February 25, 2011 at midnight PST (if you are already a Café Fashionista follower, please say so in your comment). I will randomly pick three (3) names out of a hat (who knows, one of them could be yours! ), and announce the winners on Saturday, February 26, 2011. Thanks to RumbaTime for the pictures. My fave is the lights out!!! I like the "Lights out"
Cotton candy is my fav! Like you always say, we are fashionista twins!! 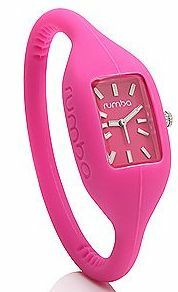 I have be wanting a Rumba watch for a long, long time! My favorite is definitely the Denim! (Although I like the Lemon Drop too). I'm tweeting about the giveaway (artfashion20) and you know I'm a Google follower (twenty.something)! the best is snow patrol!! The lemon drop is sooo adorable and perfect for spring!! I'm a twitter and google connect follower :) Thanks for hosting, love! And feel better this weekend! And Double Dare is my favorite for sure. Love Double Dare! & always been following you on google reader. My favorite would be Big Apple! Became a follower through Blogger. :) I still think my favorite is Big Apple. Oooh the yellow is my fave. already a follower and tweeting now. @modanistajunkie. These are really cute. When I saw the picture I couldn't help but recognize someone from Pretty Little Liars wore one, even before I read the description! I'm stuck between cotton candy and lemon drop... but I suppose I'll go with cotton candy. I've been dying for one of these! I'm loving the lemon drop! Awesome giveaway, Erika! I love these watches! My favorite is the lights out...I hope that doesn't make me boring...hahaha. Fun! I love that lemon yellow. Mostly because I could never lots of yellow (it looks terrible on me), but little bursts are super rad. I just love the cotton candy! Wow, how adorable! This looks so cool. Love the cotton candy! Mmm lovely like candy! 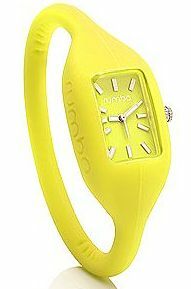 I want the pink and the lemon-y yellow... Would love one of these candies on my wrist! Hoping you have a delicious pre-valentine's day weekend Erika! Uber adorable. Especially, the cotton candy! I follow you, love them all.... I am color freak, would wear all the color palette at once :) .... but, Big apple was the cutest, I love the color. PS: you have the best giveaways ever. I love the lights out color. Ooh, I love the Cotton Candy! I love the Lights Out color, and of course I'm a follower! love them all but if i had to pick, i think i would go with denim. these are so cute! i'm so moving to the u.s! I love the cotton candy one! I'm a follower on Twitter and Blogger. I like the cotton candy the best. I folow you via GFC as nightowl. Cotton Candy is my Favorite! I love your blog! I love the Lemon Drop! Oooooh, gorgeous! "Lights Out" and I follow via Google. Thank you for the contest! I follow on Twitter and love the Cotton Candy color! I am loving the cotton candy color. Pink is my color! I also posted on twitter :) My username is pinkukitsune. what neat items...I like the red one! hope all is well...I will also tweet the giveaway!! My favorite is Lemon Drop. I tweeted about this contest. My favorite color is Lemon Drop. I follow you on Twitter. My favorite color is Lemon Drop.